Venezuela ( /ˌvɛnəˈzweɪlə/ ven-ə-zwayl-ə; Spanish: [βeneˈswela]), officially the Bolivarian Republic of Venezuela (Spanish: República Bolivariana de Venezuela), is a federal republic located on the northern coast of South America. It is bordered by Colombia on the west, Brazil on the south, Guyana on the east, and the islands of Trinidad and Tobago to the north-east. Venezuela’s territory covers around 916,445 km2 (353,841 sq mi) with an estimated population around 33,221,865. Venezuela is considered a state with extremely high biodiversity (currently ranks 7th in the world’s list of nations with the most number of species), with habitats ranging from the Andes Mountains in the west to the Amazon Basin rain-forest in the south, via extensive llanos plains and Caribbean coast in the center and the Orinoco River Delta in the east. The territory currently known as Venezuela was colonized by Spain in 1522 amid resistance from indigenous peoples. In 1811, it became one of the first Spanish-American colonies to declare independence, which was not securely established until 1821, when Venezuela was a department of the federal republic of Gran Colombia. It gained full independence as a separate country in 1830. During the 19th century, Venezuela suffered political turmoil and autocracy, remaining dominated by regional caudillos (military strongmen) until the mid-20th century. Since 1958, the country has had a series of democratic governments. Economic shocks in the 1980s and 1990s led to several political crises, including the deadly Caracazo riots of 1989, two attempted coups in 1992, and the impeachment of President Carlos Andrés Pérez for embezzlement of public funds in 1993. A collapse in confidence in the existing parties saw the 1998 election of former coup-involved career officer Hugo Chávez and the launch of the Bolivarian Revolution, beginning with a 1999 Constituent Assembly to write a newConstitution of Venezuela. This new constitution officially changed the name of the country to República Bolivariana de Venezuela (Bolivarian Republic of Venezuela). Venezuela is a federal presidential republic consisting of 23 states, the Capital District (covering Caracas), and federal dependencies (covering Venezuela’s offshore islands). 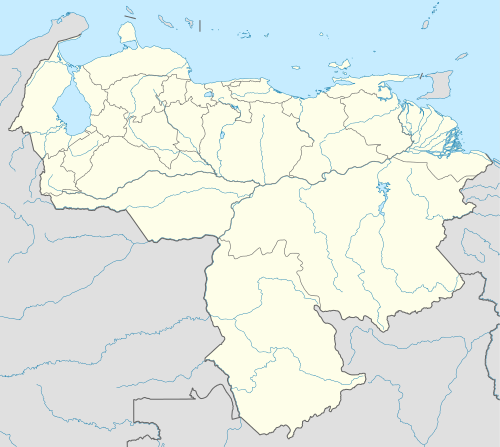 Venezuela also claims all Guyanese territory west of the Essequibo River, a 159,500-square-kilometre (61,583 sq mi) tract dubbed Guayana Esequiba or the Zona en Reclamación (the “zone being reclaimed”). Venezuela is among the most urbanized countries in Latin America, the vast majority of Venezuelans live in the cities of the north, especially in the capital (Caracas) which is also the largest city in Venezuela. Since the discovery of oil in the early 20th century, Venezuela has the world’s largest oil reserves and has been one of the world’s leading exporters of oil. Previously an underdeveloped exporter of agricultural commodities such as coffee and cocoa, oil quickly came to dominate exports and government revenues. The 1980s oil glut led to an external debt crisis and a long-running economic crisis, in which inflation peaked at 100% in 1996 and poverty rates rose to 66% in 1995 as (by 1998) per capita GDP fell to the same level as 1963, down a third from its 1978 peak. The recovery of oil prices in the early 2000s gave Venezuela oil funds not seen since the 1980s. The Venezuelan government then initiated populist/revisionist policies that initially boosted the Venezuelan economy and increased social spending, significantly reducing economic inequality and poverty. Such populist policies were questioned since their initiation and the over dependence on oil funds led to overspending on social programs while strict government polices, which were initially supposed to prevent capital flight, created difficulties for Venezuela’s import-reliant businesses. Venezuela under Hugo Chávez suffered “one of the worst cases of Dutch Disease in the world” due to the Bolivarian government’s large dependence on oil sales. Poverty and inflation began to increase into the 2010s. Nicolás Maduro was elected in 2013 after the death of Chavez. Venezuela devalued its currency in February 2013 due to the rising shortages in the country, which included those of milk, flour, and other necessities. This led to an increase in malnutrition, especially among children. In 2014, Venezuela entered an economic recession. In 2015, Venezuela had the world’s highest inflation rate with the rate surpassing 100%, becoming the highest in the country’s history. Economic problems, as well as crime and corruption, were some of the main causes of the 2014–16 Venezuelan protests, which left more than 50 protesters killed. Venezuela is considered a major renowned player in beauty pageants and cosmetics industry, a popular pastime of many Venezuelans, raking in with 22 victorious pageant titles to date. His certainty of having attained Paradise made him name this region ‘Land of Grace’, a phrase that has become the country’s nickname. Spain’s colonization of mainland Venezuela started in 1522, establishing its first permanent South American settlement in the present-day city of Cumaná. In the 16th century, Venezuela was contracted as a concession by the King of Spain to the German Welser banking family (Klein-Venedig, 1528–1546). Native caciques (leaders) such as Guaicaipuro (circa 1530–1568) and Tamanaco (died 1573) attempted to resist Spanish incursions, but the newcomers ultimately subdued them; Tamanaco was put to death by order of Caracas’ founder, Diego de Losada. In the 16th century, during the Spanish colonization, indigenous peoples, such as many of the Mariches, themselves descendants of the Kalina, converted to Roman Catholicism. Some of the resisting tribes or leaders are commemorated in place names, includingCaracas, Chacao, and Los Teques. The early colonial settlements focused on the northern coast, but in the mid-18th century, the Spanish pushed farther inland along the Orinoco River. Here, the Ye’kuana (then known as the Makiritare) organized serious resistance in 1775 and 1776. Spain’s eastern Venezuelan settlements were incorporated into New Andalusia Province. Administered by the Royal Audiencia of Santo Domingo from the early 16th century, most of Venezuela became part of the Viceroyalty of New Granada in the early 18th century, and was then reorganized as an autonomous Captaincy General starting in 1777. The town of Caracas, founded in the central coastal region in 1567, was well-placed to become a key location, being near the coastal port of La Guaira whilst itself being located in a valley in a mountain range, providing defensive strength against pirates and a more fertile and healthy climate. After a series of unsuccessful uprisings, Venezuela, under the leadership of Francisco de Miranda, a Venezuelan marshal who had fought in the American Revolution and the French Revolution, declared independence on 5 July 1811. This began the Venezuelan War of Independence. However, a devastating earthquake that struck Caracas in 1812, together with the rebellion of the Venezuelan llaneros, helped bring down the first Venezuelan republic. A second Venezuelan republic, proclaimed on 7 August 1813, lasted several months before being crushed, as well. Sovereignty was only attained after Simón Bolívar, aided by José Antonio Páez and Antonio José de Sucre, won the Battle of Carabobo on 24 June 1821. On 24 July 1823, José Prudencio Padilla and Rafael Urdaneta helped seal Venezuelan independence with their victory in the Battle of Lake Maracaibo. New Granada’s congress gave Bolívar control of the Granadian army; leading it, he liberated several countries and founded Gran Colombia. Sucre, who won many battles for Bolívar, went on to liberate Ecuador and later become the second president of Bolivia. Venezuela remained part of Gran Colombia until 1830, when a rebellion led by Páez allowed the proclamation of a newly independent Venezuela; Páez became the first president of the new republic. Between one-quarter and one-third of Venezuela’s population was lost during these two decades of warfare which by 1830 was estimated at about 800,000. Slavery in Venezuela was abolished in 1854. Much of Venezuela’s 19th-century history was characterized by political turmoil and dictatorial rule, including the Independence leader José Antonio Páez, who gained the presidency three times and served a total of 11 years between 1830 and 1863. This culminated in the Federal War (1859–1863), a civil war in which hundreds of thousands died, in a country with a population of not much more than a million people. In the latter half of the century, Antonio Guzmán Blanco, another caudillo, served a total of 13 years between 1870 and 1887, with three other presidents interspersed. In 1895, a longstanding dispute with Great Britain about the territory of Guayana Esequiba, which Britain claimed as part of British Guiana and Venezuela saw as Venezuelan territory, erupted into the Venezuela Crisis of 1895. The dispute became a diplomatic crisis when Venezuela’s lobbyist William L. Scruggs sought to argue that British behavior over the issue violated the United States’ Monroe Doctrine of 1823, and used his influence in Washington, D.C., to pursue the matter. Then, US President Grover Cleveland adopted a broad interpretation of the doctrine that did not just simply forbid new European colonies, but declared an American interest in any matter within the hemisphere. Britain ultimately accepted arbitration, but in negotiations over its terms was able to persuade the US on many of the details. A tribunal convened in Paris in 1898 to decide the issue, and in 1899 awarded the bulk of the disputed territory to British Guiana. In 1899, Cipriano Castro, assisted by his friend Juan Vicente Gómez, seized power in Caracas, marching an army from his base in the Andean state of Táchira. Castro defaulted on Venezuela’s considerable foreign debts, and declined to pay compensation to foreigners caught up in Venezuela’s civil wars. This led to the Venezuela Crisis of 1902–1903, in which Britain, Germany, and Italy imposed a naval blockade of several months, before international arbitration at the new Permanent Court of Arbitration in The Hague was agreed. In 1908, another dispute broke out with the Netherlands, which was resolved when Castro left for medical treatment in Germany and was promptly overthrown by Juan Vicente Gómez. The discovery of massive oil deposits in Lake Maracaibo during World War I proved to be pivotal for Venezuela, and transformed the basis of its economy from a heavy dependence on agricultural exports. It prompted an economic boom that lasted into the 1980s; by 1935, Venezuela’s per capita gross domestic product was Latin America’s highest. Gómez benefited handsomely from this, as corruption thrived, but at the same time, the new source of income helped him centralize the Venezuelan state and develop its authority. In 1945, a civilian-military coup overthrew Medina Angarita and ushered in a three-year period of democratic rule under the mass membership Democratic Action, initially under Rómulo Betancourt, until Rómulo Gallegos won the Venezuelan presidential election, 1947 (generally believed to be the first free and fair elections in Venezuela). Gallegos governed until overthrown by a military junta led by Marcos Pérez Jiménez and Gallegos’ Defense Minister Carlos Delgado Chalbaud in the 1948 Venezuelan coup d’état. In the 1960s, substantial guerilla movements occurred, including the Armed Forces of National Liberation and the Revolutionary Left Movement, which had split from Democratic Action in 1960. 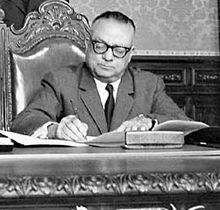 Most of these movements lay down their arms under Rafael Caldera‘s presidency (1969–74); Caldera had won the 1968 election for COPEI, being the first time a party other than Democratic Action took the presidency through a democratic election. The election of Carlos Andrés Pérez in 1973 coincided with the 1973 oil crisis, in which Venezuela’s income exploded as oil prices soared; oil industries were nationalized in 1976. This led to massive increases in public spending, but also increases in external debts, which continued into the 1980s when the collapse of oil prices during the 1980s crippled the Venezuelan economy. As the government started to devalue the currency in February 1983 to face its financial obligations, Venezuelans’ real standards of living fell dramatically. A number of failed economic policies and increasing corruption in government led to rising poverty and crime, worsening social indicators, and increased political instability. Economic crises in the 1980s and 1990s led to a political crisis in which hundreds died in the Caracazo riots of 1989, two attempted coups d’état in 1992, and the impeachment of President Carlos Andrés Pérez (re-elected in 1988) for corruption in 1993. Coup leader Hugo Chávez was pardoned in March 1994 by president Rafael Caldera, with a clean slate and his political rights reinstated. The Bolivarian Revolution refers to a leftist social movement and political process in Venezuela led by late Venezuelan president Hugo Chávez, the founder of the Fifth Republic Movement and later the United Socialist Party of Venezuela. The “Bolivarian Revolution” is named after Simón Bolívar, an early 19th-century Venezuelan and Latin American revolutionary leader, prominent in the Spanish American wars of independence in achieving the independence of most of northern South America from Spanish rule. According to Chávez and other supporters, the “Bolivarian Revolution” seeks to build a mass movement to implement Bolivarianism—popular democracy, economic independence, equitable distribution of revenues, and an end to political corruption—in Venezuela. They interpret Bolívar’s ideas from a socialist perspective. A collapse in confidence in the existing parties led to Chávez being elected president in 1998, and the subsequent launch of a “Bolivarian Revolution“, beginning with a 1999 Constituent Assembly to write a new Constitution of Venezuela. Chávez also initiated Bolivarian missions, programs aimed at helping the poor. In April 2002, Chávez was briefly ousted from power in the 2002 Venezuelan coup d’état attempt following popular demonstrations by his opponents, but he was returned to power after two days as a result of demonstrations by poor Chávez supporters in Caracas and actions by the military. Chávez also remained in power after an all-out national strike that lasted from December 2002 to February 2003, including a strike/lockout in the state oil company PDVSA. The strike produced severe economic dislocation, with the country’s GDP falling 27% during the first four months of 2003, and costing the oil industry $13.3 billion. Capital flight before and during the strike led to the reimposition of currency controls (which had been abolished in 1989), managed by the CADIVI agency. In the subsequent decade, the government was forced into several currency devaluations. These devaluations have done little to improve the situation of the Venezuelan people who rely on imported products or locally produced products that depend on imported inputs while dollar-denominated oil sales account for the vast majority of Venezuela’s exports. The profits of the oil industry have been lost to “social engineering” and corruption, instead of investments needed to maintain oil production. Chávez survived several further political tests, including an August 2004 recall referendum. He was elected for another term in December 2006 and re-elected for a third term in October 2012. However, he was never sworn in for his third period, due to medical complications. Chávez died on 5 March 2013 after a nearly two-year fight with cancer. The presidential election that took place on Sunday, 14 April 2013, was the first since Chávez took office in 1999 in which his name did not appear on the ballot. Nicolás Maduro has been the President of Venezuela since 14 April 2013, after winning the second presidential election after Chávez’s death, with 50.61% of the votes against the opposition’s candidate Henrique Capriles Radonski who had 49.12% of the votes. The Democratic Unity Roundtable contested his appointment as a violation of the constitution. However, the Supreme Court of Venezuela ruled that under Venezuela’s Constitution, Nicolás Maduro is the legitimate president and was invested as such by the Venezuelan National Assembly (Asamblea Nacional). Beginning in February 2014, hundreds of thousands of Venezuelans have protested over high levels of criminal violence, inflation, and chronic scarcity of basic goods due to policies of the federal government. Demonstrations and riots have left over 40 fatalities in the unrest between both Chavistas and opposition protesters, and has led to the arrest of opposition leaders such as Leopoldo López and Antonio Ledezma. Human rights groups have strongly condemned the arrest of Leopoldo López. In the 2015 Venezuelan parliamentary election, the opposition gained a majority. Venezuela map of Köppen climate classification. Venezuela is located in the north of South America; geologically, its mainland rests on the South American Plate. It has a total area of 916,445 km2 (353,841 sq mi) and a land area of 882,050 square kilometres (340,560 sq mi), making it the 33rd largest country in the world. The territory it controls lies between latitudes 0° and 13°N, and longitudes 59° and 74°W. The northern mountains are the extreme northeastern extensions of South America’s Andes mountain range. Pico Bolívar, the nation’s highest point at 4,979 m (16,335 ft), lies in this region. To the south, the dissectedGuiana Highlands contain the northern fringes of the Amazon Basin and Angel Falls, the world’s highest waterfall, as well as tepuis, large table-like mountains. The country’s center is characterized by the llanos, which are extensive plains that stretch from the Colombian border in the far west to the Orinoco River delta in the east. The Orinoco, with its rich alluvial soils, binds the largest and most important river system of the country; it originates in one of the largest watersheds in Latin America. The Caroní and the Apure are other major rivers. Venezuela borders Colombia to the west, Guyana to the east, and Brazil to the south. 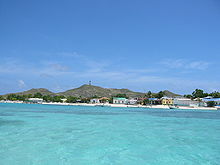 Caribbean islands such as Trinidad and Tobago, Grenada, Curaçao, Aruba, and the Leeward Antilles lie near the Venezuelan coast. Venezuela has territorial disputes with Guyana (formerly United Kingdom), largely concerning the Essequibo area, and with Colombia concerning the Gulf of Venezuela. In 1895, after years of diplomatic attempts to solve the border dispute, from Venezuela, the dispute over the Essequibo River border flared up, it was submitted to a “neutral” commission (composed of British, American, and Russian representatives and without a direct Venezuelan representative), which in 1899 decided mostly against Venezuela’s claim. Venezuela’s most significant natural resources are petroleum and natural gas, iron ore, gold, and other minerals. It also has large areas of arable land and water. Trans Andean Highway at Sierra Nevada de Mérida. The araguaney(Tabebuia chrysantha), Venezuela’s national tree. Venezuela is entirely located in the tropics over the Equator to around 12° N. Its climate varies from humid low-elevation plains, where average annual temperatures range as high as 35 °C (95.0 °F), to glaciers and highlands (the páramos) with an average yearly temperature of 8 °C (46.4 °F). Annual rainfall varies from 430 mm (16.9 in) in the semiarid portions of the northwest to over 1,000 mm (39.4 in) in the Orinoco Delta of the far east and the Amazonian Jungle in the south. The precipitation level is lower in the period from November to April and later in the year from August to October. These periods are referred to as hot-humid and cold-dry seasons. Another characteristic of the climate is this variation throughout the country by the existence of a mountain range called “Cordillera de la Costa” which crosses the country from east to west. The majority of the population lives in these mountains. The country falls into four horizontal temperature zones based primarily on elevation, having tropical, dry, temperate with dry winters, and polar (alpine tundra) climates, amongst others. In the tropical zone—below 800 m (2,625 ft)—temperatures are hot, with yearly averages ranging between 26 and 28 °C (78.8 and 82.4 °F). The temperate zone ranges between 800 and 2,000 m (2,625 and 6,562 ft) with averages from 12 to 25 °C (53.6 to 77.0 °F); many of Venezuela’s cities, including the capital, lie in this region. Colder conditions with temperatures from 9 to 11 °C (48.2 to 51.8 °F) are found in the cool zone between 2,000 and 3,000 m (6,562 and 9,843 ft), especially in the Venezuelan Andes, where pastureland and permanent snowfield with yearly averages below 8 °C (46 °F) cover land above 3,000 meters (9,843 ft) in the páramos. Campylopterus ensipennis, endemic bird of Venezuela. 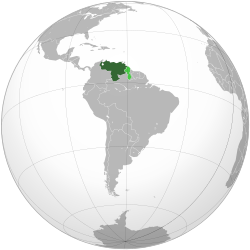 Venezuela lies within the Neotropic ecozone; large portions of the country were originally covered by moist broadleaf forests. One of 17 megadiverse countries, Venezuela’s habitats range from the Andes Mountains in the west to the Amazon Basin rainforest in the south, via extensive llanos plains and Caribbean coast in the center and the Orinoco River Delta in the east. They include xeric scrublands in the extreme northwest and coastal mangrove forests in the northeast. Its cloud forests and lowland rainforests are particularly rich. Animals of Venezuela are diverse and include manatees, three-toed sloth, two-toed sloth, Amazon river dolphins, and Orinoco crocodiles, which have been reported to reach up to 6.6 m (22 ft) in length. Venezuela hosts a total of 1,417 bird species, 48 of which are endemic. Important birds include ibises, ospreys, kingfishers, and the yellow-orange Venezuelan troupial, the national bird. Notable mammals include the giant anteater, jaguar, and the capybara, the world’s largest rodent. More than half of Venezuelan avian and mammalian species are found in the Amazonian forestssouth of the Orinoco. Among plants of Venezuela, over 25,000 species of orchids are found in the country’s cloud forest and lowland rainforest ecosystems. These include the flor de mayo orchid (Cattleya mossiae), the national flower. Venezuela’s national tree is the araguaney, whose characteristic lushness after the rainy season led novelist Rómulo Gallegos to name it “[l]a primavera de oro de los araguaneyes” (the golden spring of the araguaneyes). Choroní Beach in the Henri Pittier National Park. Venezuela is one of the 10 most biodiverse countries on the planet, yet it is one of the leaders of deforestation due to economic and political factors. Each year, roughly 287,600 hectares of forest are permanently destroyed and other areas are degraded by mining, oil extraction, and logging. Between 1990 and 2005, Venezuela officially lost 8.3% of its forest cover, which is about 4.3 million ha. In response, federal protections for critical habitat were implemented; for example, 20% to 33% of forested land is protected. The country’s biosphere reserve is part of the World Network of Biosphere Reserves; five wetlands are registered under the Ramsar Convention. In 2003, 70% of the nation’s land was under conservation management in over 200 protected areas, including 43 national parks. Venezuela’s 43 national parks include Canaima National Park, Morrocoy National Park, andMochima National Park. In the far south is a reserve for the country’s Yanomami tribes. Covering 32,000 square miles (82,880 square kilometres), the area is off-limits to farmers, miners, and all non-Yanomami settlers. Venezuela was one of the few countries that didn’t enter an INDC at COP21. Following the fall of Marcos Pérez Jiménez in 1958, Venezuelan politics were dominated by the Third Way Christian democratic COPEI and the center-left social democratic Democratic Action (AD) parties; this two-party system was formalized by the puntofijismo arrangement. Economic crises in the 1980s and 1990s led to a political crisis which resulted in hundreds dead in the Caracazo riots of 1989, two attempted coups in 1992, and impeachment of President Carlos Andrés Pérez for corruption in 1993. A collapse in confidence in the existing parties saw the 1998 election of Hugo Chávez, who had led the first of the 1992 coup attempts, and the launch of a “Bolivarian Revolution“, beginning with a 1999 Constituent Assembly to write a new Constitution of Venezuela. The opposition’s attempts to unseat Chávez included the 2002 Venezuelan coup d’état attempt, the Venezuelan general strike of 2002–2003, and the Venezuelan recall referendum, 2004, all of which failed. 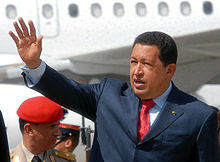 Chávez was re-elected in December 2006, but suffered a significant defeat in 2007 with the narrow rejection of the Venezuelan constitutional referendum, 2007, which had offered two packages of constitutional reforms aimed at deepening the Bolivarian Revolution. The unicameral Venezuelan parliament is the Asamblea Nacional (“National Assembly”). The number of members is variable – each state and the Capital district elect three representatives plus the result of dividing the state population by 1.1% of the total population of the country. Three seats are reserved for representatives of Venezuela’s indigenous peoples. For the 2011–2016 period the number of seats is 165. All deputies serve five-year terms. The legal system of Venezuela belongs to the Continental Law tradition. The highest judicial body is the Supreme Tribunal of Justice or Tribunal Supremo de Justicia, whose magistrates are elected by parliament for a single two-year term. The National Electoral Council (Consejo Nacional Electoral, or CNE) is in charge of electoral processes; it is formed by five main directors elected by the National Assembly. Supreme Court president Luisa Estela Morales said in December 2009 that Venezuela had moved away from “a rigid division of powers” toward a system characterized by “intense coordination” between the branches of government. Morales clarified that each power must be independent adding that “one thing is separation of powers and another one is division”. Parliamentary Elections were held in Venezuela on 6 December 2015 to elect the 164 deputies and three indigenous representatives of the National Assembly. In 2014, a series of protest and demonstrations began in Venezuela, attributed to inflation, violence and shortages in Venezuela. The government has accused the protest of being motivated by ‘fascists‘ opposition leaders, capitalism and foreign influence, despite of it had been largely peaceful. President Maduro acknowledged PSUV defeat, but attributed the opposition’s victory to an intensification of the “economic war”. Despite of that, Maduro said “I will stop by hook or by crook the opposition coming to power, whatever the costs, in any way”. In the following months, Maduro fulfilled his promise of avoiding the elected democratically and constitutionally National Assembly to legislate. First step taken by PSUV and government where the substitution of the entire Supreme Court a day after the Parliamentary Elections contrary to the Constitution of Venezuela, acclaimed as a fraud by the majority of the Venezuelan and international press. The PSUV government used this violation to suspend several elected opponents, ignoring again the Constitution of Venezuela. Maduro said that the “the Amnesty law (approved by the Parliament) will not be executed” and asked the Supreme Court to declare it unconstitutional before the law where knew. In January, 16th 2016, Maduro approved an unconstitutional economic emergency decree, relegating to his own figure the legislative and executive powers, helding also the judiciary power through the fraudulent designation of judges the day after the election on December 6, 2015. After that events, Maduro effectively controls the three democratic powers. In May 14, 2016, constitutional guarantees were in fact suspended when Maduro decreed the extension of the economic emergency decree for another 60 days and declares a State of emergency, which is a clear violation of the Constitution of Venezuela in the Article 338th: “The approval of the extension of States of emergency corresponds to the National Assembly.”. Thus, constitutional rights in Venezuela are considered suspended in fact by a large number of publications and public figures. On May 14, 2016, the Organization of American States manifest to be studying to Apply the Inter-American Democratic Charter with sanctions for non-compliance to its own Constitution to Venezuela. Throughout most of the 20th century, Venezuela maintained friendly relations with most Latin American and Western nations. Relations between Venezuela and the United States government worsened in 2002, after the 2002 Venezuelan coup d’état attempt during which the U.S. government recognized the short-lived interim presidency of Pedro Carmona. In 2015, Venezuela was declared a national security threat by U.S. President Barack Obama. Correspondingly, ties to various Latin American and Middle Eastern countries not allied to the U.S. have strengthened. For example, Palestinian foreign minister Riyad al-Maliki declared in 2015 that Venezuela was his country’s “most important ally”. Venezuela seeks alternative hemispheric integration via such proposals as the Bolivarian Alternative for the Americas trade proposal and the newly launched pan-Latin American television network teleSUR. Venezuela is one of the six nations in the world—along with Russia, Nicaragua, Nauru, Vanuatu, and Tuvalu—to have recognized the independence of Abkhazia and South Ossetia. Venezuela was a proponent of OAS‘s decision to adopt its Anti-Corruption Convention, and is actively working in the Mercosur trade bloc to push increased trade and energy integration. Globally, it seeks a “multi-polar” world based on strengthened ties among undeveloped countries. 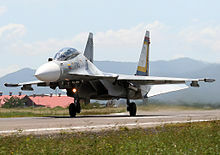 A Sukhoi SU-30MKV of the Venezuelan air force. Murder rate (1 murder per 100,000 citizens) from 1998 to 2013. Venezuela was the most murderous place on Earth in 2015. In Venezuela, a person is murdered every 21 minutes. Violent crimes have been so prevalent in Venezuela that the government no longer produces the crime data. In 2013, the homicide rate was approximately 79 per 100,000, one of the world’s highest, having quadrupled in the past 15 years with over 200,000 people murdered. By 2015 it had risen to 90 per 100,000. The country’s body count of the previous decade mimics that of the Iraq War and in some instances had more civilian deaths even though the country is at peacetime. The capital Caracas has one of the greatest homicide rates of any large city in the world, with 122 homicides per 100,000 residents. In 2008, polls indicated that crime was the number one concern of voters. Attempts at fighting crime such as Operation Liberation of the People have been done to crack down on gang-controlled areas. Venezuela is especially dangerous toward foreign travelers and investors who are visiting. The United States State Department and the Government of Canada have warned foreign visitors that they may be subjected to robbery, kidnapping for a ransom or sale to terrorist organizations and murder, and that their own diplomatic travelers are required to travel in armored vehicles. The United Kingdom’s Foreign and Commonwealth Office has advised against all travel to Venezuela. Visitors have been murdered during robberies and criminals do not discriminate against their victims. Recently, former Miss Venezuela 2004 winner Monica Spear and her husband were murdered with her 5-year-old daughter being shot while visiting, and an elderly German tourist was murdered only a few weeks later. There are approximately 33 prisons holding about 50,000 inmates. They include; El Rodeo outside of Caracas, Yare Prison in the northern state of Miranda, and several others. Venezuela’s prison system is heavily overcrowded; its facilities have capacity for only 14,000 prisoners. Corruption in Venezuela is high by world standards, and was so for much of the 20th century. The discovery of oil had worsened political corruption, and by the late 1970s, Juan Pablo Pérez Alfonso‘s description of oil as “the Devil’s excrement” had become a common expression in Venezuela. Venezuela has been ranked one of the most corrupt countries on the Corruption Perceptions Index since the survey started in 1995. The 2010 ranking placed Venezuela at number 164, out of 178 ranked countries. Similarly, the World Justice Project ranked Venezuela 99th out of 99 countries surveyed in its 2014 Rule of Law Index. This corruption is shown with Venezuela’s significant involvement in drug trafficking, with Colombian cocaine and other drugs transiting Venezuela towards the United States and Europe. Venezuela ranks fourth in the world for cocaine seizures, behind Colombia, the United States, and Panama. In 2006 the government’s agency for combating the Illegal drug trade in Venezuela, ONA, was incorporated into the office of the Vice-President of the country. However, many major government and military officials have been known for their involvement with drug trafficking; especially with the October 2013 incident of men from the Venezuelan National Guard placing 1.3 tons of cocaine on a Paris flight knowing they will not face charges. Venezuela is divided into 23 states (estados), a capital district (distrito capital) corresponding to the city of Caracas, and theFederal Dependencies (Dependencias Federales, a special territory). Venezuela is further subdivided into 335 municipalities(municipios); these are subdivided into over one thousand parishes (parroquias). The states are grouped into nine administrative regions (regiones administrativas), which were established in 1969 by presidential decree. The Central Range runs parallel to the coast and includes the hills surrounding Caracas; the Eastern Range, separated from the Central Range by the Gulf of Cariaco, covers all of Sucre and northern Monagas. The Insular Region includes all of Venezuela’s island possessions: Nueva Esparta and the various Federal Dependencies. The Orinoco Delta, which forms a triangle covering Delta Amacuro, projects northeast into the Atlantic Ocean. Graphical depiction of Venezuela’s product exports in 28 color-coded categories. The Central Bank of Venezuela is responsible for developing monetary policy for the Venezuelan bolívar which is used as currency. The currency is primarily printed on paper and distributed throughout the country. The President of the Central Bank of Venezuela is presently Eudomar Tovar, who also serves as the country’s representative in the International Monetary Fund. According to the Heritage Foundation and the Wall Street Journal, Venezuela has the weakest property rights in the world, scoring only 5.0 on a scale of 100; expropriation without compensation is not uncommon. Venezuela has a Market-based mixed economy dominated by the petroleumsector, which accounts for roughly a third of GDP, around 80% of exports, and more than half of government revenues. Per capita GDP for 2009 was US$13,000, ranking 85th in the world. Venezuela has the least expensive petrol in the world because the consumer price of petrol is heavily subsidized. More than 60% of Venezuela’s international reserves is in gold, eight times more than the average for the region. Most of Venezuela’s gold held abroad is located in London. On 25 November 2011, the first of US$11 billion of repatriated gold bullion arrived in Caracas; Chávez called the repatriation of gold a “sovereign” step that will help protect the country’s foreign reserves from the turmoil in the U.S. and Europe. However government policies quickly spent down this returned gold and in 2013 the government was forced to add the dollar reserves of state owned companies to those of the national bank in order to reassure the international bond market. Manufacturing contributed 17% of GDP in 2006. Venezuela manufactures and exports heavy industry products such as steel, aluminium and cement, with production concentrated around Ciudad Guayana, near the Guri Dam, one of the largest in the world and the provider of about three-quarters of Venezuela’s electricity. Other notable manufacturing includes electronics and automobiles, as well as beverages, and foodstuffs. Agriculture in Venezuela accounts for approximately 3% of GDP, 10% of the labor force, and at least a quarter of Venezuela’s land area. Venezuela exports rice, corn, fish, tropical fruit, coffee, beef, and pork. The country is not self-sufficient in most areas of agriculture. In 2012, total food consumption was over 26 million metric tonnes, a 94.8% increase from 2003. Since the discovery of oil in the early 20th century, Venezuela has been one of the world’s leading exporters of oil, and it is a founding member of OPEC. Previously an underdeveloped exporter of agricultural commodities such as coffee and cocoa, oil quickly came to dominate exports and government revenues. The 1980s oil glut led to an external debt crisis and a long-running economic crisis, which saw inflation peak at 100% in 1996 and poverty rates rise to 66% in 1995 as (by 1998) per capita GDP fell to the same level as 1963, down a third from its 1978 peak. The 1990s also saw Venezuela experience a major banking crisis in 1994. The recovery of oil prices after 2001 boosted the Venezuelan economy and facilitated social spending. With social programs such as the Bolivarian Missions, Venezuela initially made progress in social development in the 2000s, particularly in areas such as health, education, and poverty. Many of the social policies pursued by Chávez and his administration were jump-started by the Millennium Development Goals, eight goals that Venezuela and 188 other nations agreed to in September 2000. The sustainability of the Bolivarian Missions has been questioned due to the Bolivarian state’s overspending on public works and because the Chávez government did not save funds for future economic hardships like other OPEC nations; with economic issues and poverty rising as a result of their policies in the 2010s. In 2003 the government of Hugo Chávez implemented currency controls after capital flight led to a devaluation of the currency. This led to the development of a parallel market of dollars in the subsequent years. The fallout of the 2008 global financial crisis saw a renewed economic downturn. Despite controversial data shared by the Venezuelan government showing that the country had halved malnutrition following one of the UN’s Millennium Development Goals, shortages of staple goods began to occur in Venezuela and malnutrition began to increase. In early 2013, Venezuela devalued its currency due to growing shortages in the country. The shortages included, and may still include, necessities such as toilet paper, milk, and flour, Fears rose so high due to the toilet paper shortage that the government occupied a toilet paper factory, and continued further plans to nationalize other industrial aspects like food distribution. Venezuela’s bond ratings have also decreased multiple times in 2013 due to decisions by the president Nicolás Maduro. One of his decisions was to force stores and their warehouses to sell all of their products, which led to even more shortages in the future. Venezuela’s outlook has also been deemed negative by most bond-rating services. Empty shelves in a store in Venezuela due to shortages. Shortages in Venezuela have been prevalent following the enactment of price controls and other policies during the economic policy of the Hugo Chávez government. Under the economic policy of the Nicolás Maduro government, greater shortages occurred due to the Venezuelan government’s policy of withholding United States dollars from importers with price controls. Shortages occur in regulated products, such as milk, various types of meat, chicken, coffee, rice, oil, precooked flour, butter prices, luxuries such as breast implants, and goods including basic necessities like toilet paper, personal hygiene products, and even medicine. As a result of the shortages, Venezuelans must search for food, wait in lines for hours and sometimes settle without having certain products. A drought, combined with a lack of planning and maintenance, has caused a hydroelectricity shortage. To deal with lack of power supply, in April 2016 the Maduro government announced rolling blackouts and reduced the government workweek to Monday and Tuesday. Venezuela has the largest oil reserves, and the eighth largest natural gas reserves in the world, and consistently ranks among the top ten world crude oil producers. Compared to the preceding year another 40.4% in crude oil reserves were proven in 2010, allowing Venezuela to surpass Saudi Arabia as the country with the largest reserves of this type. The country’s main petroleum deposits are located around and beneath Lake Maracaibo, the Gulf of Venezuela (both in Zulia), and in the Orinoco River basin (eastern Venezuela), where the country’s largest reserve is located. Besides the largest conventional oil reserves and the second-largest natural gas reserves in the Western Hemisphere,Venezuela has non-conventional oil deposits (extra-heavy crude oil, bitumen and tar sands) approximately equal to the world’s reserves of conventional oil. The electricity sector in Venezuela is one of the few to rely primarily on hydropower, and includes the Guri Dam, one of the largest in the world. In 1973, Venezuela voted to nationalize its oil industry outright, effective 1 January 1976, with Petróleos de Venezuela (PDVSA) taking over and presiding over a number of holding companies in subsequent years, Venezuela built a vast refining and marketing system in the U.S. and Europe. In the 1990s PDVSA became more independent from the government and presided over an apertura (opening) in which it invited in foreign investment. Under Hugo Chávez a 2001 law placed limits on foreign investment. The state oil company PDVSA played a key role in the December 2002 – February 2003 national strike which sought President Chávez’ resignation. Managers and skilled highly paid technicians of PDVSA shut down the plants and left their posts, and by some reports sabotaged equipment, and petroleum production and refining by PDVSA almost ceased. Activities eventually were slowly restarted by returning and substitute oil workers. As a result of the strike, around 40% of the company’s workforce (around 18,000 workers) were dismissed for “dereliction of duty” during the strike. Venezuela is connected to the world primarily via air (Venezuela’s airports include the Simón Bolívar International Airport in Maiquetía, near Caracas and La Chinita International Airport near Maracaibo) and sea (with major sea ports at La Guaira, Maracaibo and Puerto Cabello). In the south and east the Amazon rainforest region has limited cross-border transport, in the west, there is a mountainous border of over 2,213 kilometres (1,375 mi) shared with Colombia. The Orinoco River is navigable by oceangoing vessels up to 400 kilometres (250 mi) inland, and connects the major industrial city of Ciudad Guayana to the Atlantic Ocean. Venezuela has a limited national railway system, which has no active rail connections to other countries. The government of Hugo Chávez tried to invest in expanding it, but Venezuela’s rail project is on hold due to Venezuela not being able to pay the $7.5 billion and owing China Railway nearly $500 million. Several major cities have metro systems; the Caracas Metro has been operating since 1983. The Maracaibo Metro and Valencia Metrowere opened more recently. Venezuela has a road network of nearly 100,000 kilometres (62,000 mi) in length, placing the country around 45th in the world; around a third of roads are paved. Water supply and sanitation in Venezuela has been extended to an increasing number of people during the 2000s, although many poor remain without access to piped water. Service quality for those with access is mixed, with water often being supplied only on an intermittent basis and most wastewater not being treated. Non-revenue water is estimated to be high at 62%, compared to the regional average of 40%. Tap water is relatively inexpensive, because of a national tariff freeze imposed in 2003 and a policy not to recover capital costs. Investments are financed primarily by the national government, with little reliance on external financing. The sector remains centralized despite a decentralization process initiated in the 1990s that has now been stalled. Within the executive, sector policies are determined by the Ministry of Environment. The national water company HIDROVEN serves about 80% of the population. The remainder is being served by five state water companies, the Corporación Venezolana de Guayana (CVG), a few municipalities and community-based organizations. Since the early 2000s the government encouraged the creation of about 7,500 Mesas Tecnicas del Agua, which have both a technical function and a political mobilization function. Major investment projects include the restoration of the polluted Valencia Lake and of the Guaire river basin in Caracas (2005–2013). Venezuela is among the most urbanized countries in Latin America, the vast majority of Venezuelans live in the cities of the north, especially in the capital Caracas, which is also the largest city. About 93% of the population lives in urban areas in northern Venezuela; 73% live less than 100 kilometres (62 mi) from the coastline. According to a study by sociologists of the Central University of Venezuela, over 1.5 million Venezuelans, or about 4% to 6% of the country’s population, left Venezuela following the Bolivarian Revolution. Though almost half of Venezuela’s land area lies south of the Orinoco, only 5% of Venezuelans live there. The largest and most important city south of the Orinoco is Ciudad Guayana, which is the sixth most populous conurbation. Other major cities include Barquisimeto, Valencia, Maracay, Maracaibo, Mérida, San Cristóbal and Barcelona–Puerto la Cruz. The people of Venezuela come from a variety of heritages. It is estimated that the majority of the population is of mestizo, or mixed, ethnic heritage. Nevertheless, in the 2011 census, which Venezuelans were asked to identify themselves according to their customs and ancestry, the term mestizo was excluded from the answers. The majority claimed to be mestizo or white — 51.6% and 43.6%, respectively. Practically half of the population claimed to bemoreno, a term used throughout Ibero-America that in this case means “dark-skinned” or “brown-skinned”, as opposed to having a lighter skin (this term connotes skin color or tone, rather than facial features or descent). Ethnic minorities in Venezuela consist of groups that descend mainly from African or indigenous peoples; 2.8% identified themselves as “black” and 0.7% as afrodescendiente (Afro-descendant), 2.6% claimed to belong to indigenous peoples, and 1.2% answered “other races”. According to an autosomal DNA genetic study conducted in 2008 by the University of Brasília (UNB), the composition of Venezuela’s population is 60.60% of European contribution, 23% of indigenous contribution, and 16.30% of African contribution. During the colonial period and until after the Second World War, many of the European immigrants to Venezuela came from the Canary Islands, which had a significant cultural impact on the cuisine and customs of Venezuela. These influences on Venezuela has led to the nation being called the 8th island of the Canaries. With the start of oil exploitation in the early 20th century, companies from the United States began establishing operations in Venezuela, bringing with them US citizens. Later, during and after the war, new waves of immigrants from other parts of Europe, the Middle East, and China began; many were encouraged by government-established immigration programs and lenient immigration policies. During the 20th century, Venezuela, along with the rest of Latin America, received millions of immigrants from Europe. This was especially true post-World War II, as a consequence of war-ridden Europe. During the 1970s, while experiencing an oil-export boom, Venezuela received millions of immigrants from Ecuador, Colombia, and the Dominican Republic. Due to the belief that this immigration influx depressed wages, some Venezuelans opposed European immigration. The Venezuelan government, however, were actively recruiting immigrants from Eastern Europe to fill a need for engineers. Millions of Colombians, as well as Middle Eastern and Haitian populations would continue immigrating to Venezuela into the early 21st century. The total indigenous population of the country is estimated at about 500 thousand people (2.8% of the total), distributed among 40 indigenous peoples. The Constitution recognizes the multi-ethnic, pluri-cultural, and multilingual character of the country and includes a chapter devoted to indigenous peoples’ rights, which opened up spaces for their political inclusion at national and local level in 1999. Most indigenous peoples are concentrated in eight states along Venezuela’s borders with Brazil, Guyana, and Colombia, and the majority groups are the Wayuu (west), the Warao (east), the Yanomami (south), and the Pemon (southeast). Religion in Venezuela according to the 2011 census. According to the 2011 census, 88 percent of the population is Christian, primarily Roman Catholic (71%), and the remaining 17 percent Protestant (primarily Evangelicalism). The Venezuelans without religion are 8% (atheist 2% and agnostic or indifferent 6%), almost 3% of the population follow other religions (1% of them are of santeria). Venezuelan art was initially dominated by religious motifs. However, in the late 19th century, artists began emphasizing historical and heroic representations of the country’s struggle for independence. This move was led by Martín Tovar y Tovar. Modernism took over in the 20th century. Notable Venezuelan artists include Arturo Michelena, Cristóbal Rojas,Armando Reverón, Manuel Cabré; the kinetic artists Jesús Soto, Gego and Carlos Cruz-Díez, and contemporary artists as Marisol and Yucef Merhi. Venezuelan literature originated soon after the Spanish conquest of the mostly pre-literate indigenous societies. It was originally dominated by Spanish influences. Following the rise of political literature during the Venezuelan War of Independence, Venezuelan Romanticism, notably expounded by Juan Vicente González, emerged as the first important genre in the region. Although mainly focused on narrative writing, Venezuelan literature was advanced by poets such as Andrés Eloy Blanco and Fermín Toro. Major writers and novelists include Rómulo Gallegos, Teresa de la Parra, Arturo Uslar Pietri, Adriano González León, Miguel Otero Silva, and Mariano Picón Salas. The great poet and humanistAndrés Bello was also an educator and intellectual (He was also a childhood tutor and mentor of Simón Bolívar). Others, such as Laureano Vallenilla Lanz and José Gil Fortoul, contributed to Venezuelan Positivism. 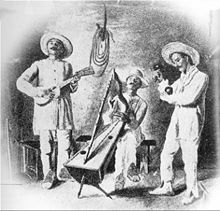 Indigenous musical styles of Venezuela are exemplified by the groups Un Sólo Pueblo and Serenata Guayanesa. The national musical instrument is the cuatro. 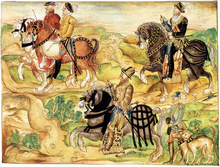 Typical musical styles and pieces mainly emerged in and around the llanos region, including Alma Llanera (by Pedro Elías Gutiérrez and Rafael Bolívar Coronado), Florentino y el diablo (by Alberto Arvelo Torrealba), Concierto en la llanura by Juan Vicente Torrealba, and Caballo Viejo (by Simón Díaz). In the early 21st century, a movement known as “Movida Acústica Urbana” featured musicians trying to save some national traditions, creating their own songs but using traditional instruments. Some groups in this tradition are Tambor Urbano, Los Sinverguenzas, the C4Trio, and Orozco Jam. Afro-Venezuelan musical traditions are most intimately related to the festivals of the “black folk saints” San Juan and San Benito. Specific songs are related to the different stages of the festival and of the procession, when the saints start their yearly paseo – stroll – through the community to dance with their people. The origins of baseball in Venezuela is unclear, although it is known that the sport was being played in the nation by the late 19th century. In the early 20th century, North American immigrants who came to Venezuela to work in the nation’s oil industry helped to popularize the sport in Venezuela. During the 1930s, baseball’s popularity continued to rise in the country, leading to the foundation of the Venezuelan Professional Baseball Leaguein 1945, and the sport would soon become the nation’s most popular. The immense popularity of baseball in the country makes Venezuela a rarity among its South American neighbors—association football, locally called fútbol, is the dominant sport in the continent. However, football, as well as basketball, are among the more popular sports played in Venezuela. Venezuela hosted the 2012 Basketball World Olympic Qualifying Tournament and the 2013 FIBA Basketball Americas Championship, which took place in Poliedro de Caracas. Although not as popular in Venezuela as the rest of South America, football, spearheaded by the Venezuela national football team is gaining popularity as well. The sport is also noted for having an increased focus during the World Cup. According to the CONMEBOL alphabetical rotation policy established in 2011, Venezuela is scheduled to host the Copa América every 40 years. Venezuela is also home to Formula 1 driver, Pastor Maldonado. At the 2012 Spanish Grand Prix, he claimed his first pole and victory and became the first and only Venezuelan to have done so in the history of Formula 1. Maldonado has increased the reception of Formula 1 in Venezuela, helping to popularize the sport in the nation. In the 2012 Summer Olympics, Venezuelan Rubén Limardo won a gold medal in fencing. Internationally, Venezuela has been well documented for its successes in beauty pageants. Miss Venezuela is a closely followed event throughout the country, and Venezuela has received 6 Miss World, 7 Miss Universe, 7 Miss International and 2 Miss Earth titles. Carlos Raúl Villanueva was the most important Venezuelan architect of the modern era; he designed the Central University of Venezuela, (a World Heritage Site) and its Aula Magna. Other notable architectural works include the Capitolio, the Baralt Theatre, the Teresa Carreño Cultural Complex, and the General Rafael Urdaneta Bridge. The literacy rate for the adult population was already 91.1 by 1998. In 2008, 95.2% of the adult population was literate. Net primary school enrollment rate was at 91% in 2005. Net secondary enrollment rate was at 63% in 2005. Venezuela has a number of universities, of which the most prestigious are the Central University of Venezuela (UCV), founded in Caracas in 1721, the University of Zulia (LUZ) founded in 1891, the University of the Andes (ULA), founded in Mérida State in 1810, the Simón Bolívar University (USB), founded in Miranda State in 1967 and the University of the East (UDO), founded in Sucre State in 1958. Currently, large numbers of Venezuelan graduates seek for a future elsewhere due to the country’s troubled economy and heavy crime rate. In a study titled Venezolana Community Abroad. A New Method of Exile by Thomas Paez, Mercedes Vivas and Juan Rafael Pulido of the Central University of Venezuela, over 1.35 million Venezuelan college graduates had left the country since the beginning of the Bolivarian Revolution. It is believed nearly 12% of Venezuelans live abroad with Ireland becoming a popular destination for students. According to Claudio Bifano, president of the Venezuelan Academy of Physical, Mathematical and Natural Sciences, more than half of medical graduates in 2013 had left Venezuela. Venezuela has a national universal health care system. The current government has created a program to expand access to health care known as Misión Barrio Adentro, although its efficiency and work conditions have been criticized. It has reported that many of the clinics were closed and as of December 2014, it was estimated that 80% of Barrio Adentro establishments were abandoned in Venezuela. Infant mortality in Venezuela is 19.33 deaths per 1,000 births for 2014, lower than the South American average (by comparison, the U.S. stands at 5.9 deaths per 1,000 births in 2013). Child malnutrition (defined as stunting or wasting in children under age five) stands at 17%; Delta Amacuro and Amazonas have the nation’s highest rates. According to the United Nations, 32% of Venezuelans lack adequate sanitation, primarily those living in rural areas. Diseases ranging from typhoid, yellow fever, cholera, hepatitis A, hepatitis B, and hepatitis D are present in the country. Obesity is prevalent in approximately 30% of the adult population in Venezuela. During the economic crisis observed under President Maduro’s presidency, medical professionals were forced to perform outdated treatments on patients. a. The “Bolivarian Republic of Venezuela” has been the full official title since the adoption of the newConstitution of 1999, when the state was renamed in honor of Simón Bolívar. b. The Constitution also recognizes all indigenous languages spoken in the country. c. Some important subgroups include those ofSpanish, Italian, Amerindian, African, Portuguese,Arab and German descent. d. Area totals include only Venezuelan-administered territory. e. On 1 January 2008, a new bolivar was introduced, the bolívar fuerte (ISO 4217 code VEF) worth 1,000 VEB.